Well I am here at the school (again), finishing up the last of my grades. I have a test and a half to grade. Then I have to enter in these last grades. Then I am done. After today I will not be a white collar worker, I will resume my job as a furniture mover which will make me a blue-collar no-collar worker, which is frankly the job that is more suited to my intellectual abilities. My background music for this last little bit: Cool Hand Luke, the Fires of Life. I learned something new about myself today: Too many people get me overwhelmed. I saw so many people today that I would have liked to spend about an hour or so with each of them. But there were so many all in the same place, all at the same time, that I ended up spending absolutely zero time with any of them. I would like to talk more about this experience later, but I did want to do a short post just to let any of those people know that I didn't neglect them on purpose. even if someone told you.'" Well, I gave my first two exams today: the Algebra I exam, and the Prealgebra exam. The results aren't in yet, I am about half done grading the first one right now. Since I know that all of you out there are still using the Algebra that you learned in Algebra I, I would like to post 4 questions on this blog. 2. Solve this absolute value inequality. 3. Solve this system of linear equations. 4. Solve this quadratic equation. It is Saturday, and I am at the school typing my final exams. For the lips of a priest ought to preserve knowledge, and from his mouth men should seek instruction -- because he is the messenger of the Lord Almighty. There are some things that just ought to be. One of them is that a priest ought to preserve knowledge. Out of a priest's mouth, there should be a flow of instruction. This just ought to be. I know that things are different now than Malachi's time. But I think that the principle is the same. And I am thinking specifically of teachers and pastors. As a teacher, I know that whatever happens in my classroom, under my watch, teaches something. I usually summarize it by saying, "What happens, teaches." I picked this phrase up at some point in the last 5 years of teaching, but I can't remember where now. The point is that it is totally true. It puts a whole new perspective on what I allow, and what I don't allow. For example, let's say that I tell a class not to talk, and then a few minutes later there are a couple of girls in the back talking. To teach grace, I am gracious. I might allow them some mistakes, with no consequences. I might even let things go for awhile, but if it continues, there is something else that needs to be taught. Obedience is important to God. It matters to Him. He tells us in more than one place that we should obey the authority that He sets over us. If I allow the disobedience to continue without anything, I am teaching, first of all, that this is OK with me. And then through that I am teaching that this is OK with God. I hope that my life will not be one that causes others to stumble, but one that leads others into the truth. This time of year is so frustrating as a teacher. It is so busy. And it doesn't matter how hard I try, there is always more to do. Oh, and to top everything off, the students are so extremely restless. Doesn't leave much time to blog. I think that one of the most interesting side-effects of blogging, is when your students begin to blog. Generally, when people begin any form of on-line journaling, they feel a little bit more free to express themselves. Sometimes these student-bloggers are anonymous, which brings even more freedom to speak one's mind. Their thoughts and feelings begin to pour out on a computer screen and sent off into the world. And many times things that never would have been shared vocally, are being shared. When these blogs are not anonymous, but the writers are still very free with their thoughts, this can lead to trouble. There are many that just spout off too much, then people are hurt and/or offended by what has been written. Sometimes students will do new postings and read each others blogs on a daily basis. When this happens, it almost becomes a little community. This kind of student blogging is the most interesting. When students begin sharing their real feelings on different topics, such as school policies, or theological questions, you really begin to know who these students are. As a teacher, this kind of information is invaluable. Especially as a teacher that likes to take "rabbit trails" knowing what is interesting to the students helps to have well-placed diversions. Next year I am teaching a class called Self-Confrontation. I am already pretty excited about this class. I am mentioning it right now because I am thinking about requiring a journal for the class. And because of the ease of the current blogging environment, I am strongly considering having them do an online journal. It would have to be separate from their current blogs, if they have any, and it would be a spiritual/devotional journal. Nothing too personal, but informative. A what are you learning journal. Last year I helped the English teacher, at the school where I was teaching, set her students up with blogs. She would then post a topic occasionally and then check to see if her students had posted about that topic. It worked really well, or so I thought, but it also made the journaling a little bit more interesting to them. I have finally done it. I started a 27 blog. 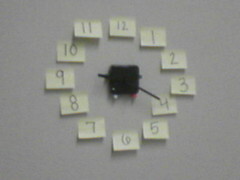 Actually, I think that I like my new "post-it note" clock. It is kinda stylish. I wonder if it will catch on. Maybe I should try to patent the idea. he is my fortress' I will never be shaken. Have you ever seen any of those pictures from an Irish hillside. There is this beautiful landscape, and criss-crossed across the hills are these ancient stone fences. The ones that were built by hand hundreds of years ago. Usually when I see these scenes, it is on some public television station, and there is this old, pipe-smoking guy telling the viewers how each piece of stone was carefully placed to make such a time-enduring piece of architecture. But then right next to him is this section of stone fence that has toppled to the ground. Which, frankly, is exactly what I expected to happen. I mean, look at those fences, there is no mortar, no internal lattice-work to keep it all together; yet there are sections of those fences that have outlasted anything else from the time period when it was built. But there are always those weak sections that are in the wall, maybe a piece of stone wasn't placed just right or at some point in the past there was a major jolt to this piece of wall, but whatever it is, this is what I think of when I read this passage. A leaning wall, a tottering fence: this is me. But my God is not like that leaning, teetering wall. He is a strong tower. He is an unshakable fortress. And as long as I am in Him, this mortarless wall is still here. "Oh, that one of you would shut the temple doors, so that you would not light useless fires on my altar! I am not pleased with you," says the LORD Almighty, "and I will accept no offering from your hands." Shut the doors! One of you, please shut the doors! The first chapter in the book of Malachi is all about how the sacrifices of the people had become a ritual. They were doing what they were supposed to do, but they were not bringing their best. They were bringing the diseased, crippled and blind sacrifices. The garbage of the flock. The ones that were going to die anyway. And God was not pleased. Therefore, I urge you, brothers, in view of God's mercy, to offer your bodies as living sacrifices, holy and pleasing to God—this is your spiritual act of worship. Notice that living as sacrifices to God is worship. We are to offer ourselves up to Him. No longer is it about the animals that we bring; it is about the life that we bring. Worship isn't the song and dance that we put on at church. It is the life that we live Monday through Saturday. How different are we from these people? Are we only doing what we would do anyway? "Shut the doors! Keep them out of the churches, their lives are detestable. Sure they come and sing their songs. Sure they lift up their hands in a show of worship, but the sacrifice is weak and lame and crippled. It is detestable! Oh, that someone would shut the doors!" In case you didn't know, it is National Teacher's Day. And since yours truly is a teacher, I just thought that I would let you know. Maybe I will work on my Froogle list today, just in case you want to get me something. Summary: The Red Sea Rules is a short study on the situation that the Israelites found themselves in on the shores of the Red Sea. It uses this story and the lessons to apply them to today's situations. All of us find ourselves in tough situations from time to time. The sea was before them, Pharaoh's hosts behind them, and the mountains around them. And all this, be it observed, permitted and ordered of God. Ultimately, we all need to recognize this truth. God is and always will be in control of the situation. And His purposes are good. Rule 1 - Realize that God means you to be where you are. Rule 2 - Be more concerned for God's glory than for your relief. Rule 3 - Acknowledge your enemy, but keep your eyes on the Lord. Rule 5 - Stay calm and confident, and give God time to work. Rule 6 - When unsure, just take the next logical step by faith. Rule 7 - Envision God's enveloping presence. Rule 8 - Trust God to deliver in His own unique way. Rule 9 - View your current crisis as a faith builder for the future. Rule 10 - Don't forget to praise Him. My Thoughts: I thought this book was a great read. As I mentioned before, the short chapters made this book easy to read, but those short chapters were full of really good content. I always love books that are full of quotes. The work of this author compiling the wisdom of several other authors is both enlightening and enjoyable. Sometimes when books like this are written, I feel like they are trying to pull a point out of thin air. But I didn't feel that way about this book. The Bible tells us that the things that happened to those people in the Old Testament, happened as an example for us. Sometimes the example is what to do, sometimes it is what not to do. But ultimately, these things happen as an example of who God is, and how He works with us. Click the link below to check out more details of this book.